Flight training is now available in the F-104 Starfighter. The new civilian flight training program for licensed pilots is offered exclusively by commercial space marketing company Infinity Space, Inc. Ground school and in-flight instruction is provided by Starfighters, Inc., operators of the largest privately-owned fleet of F-104 aircraft. 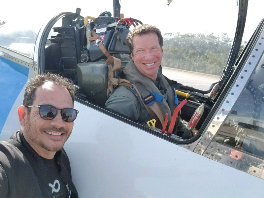 PRESS RELEASE – American businessman John Rost has become the first to complete a new FAA approved F-104 flight training program at NASA’s Kennedy Space Center. 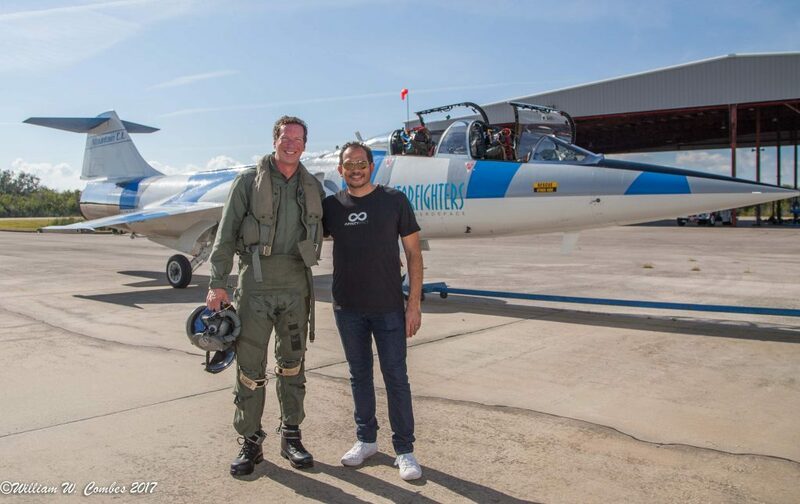 The adventurer, pilot and CEO of Fiesta Insurance completed four training flights in the Mach 2+ Lockheed F-104 Starfighter, the same supersonic plane used to prepare Mercury, Gemini and Apollo astronauts for space travel. His ground school and flight training was completed at NASA’s Shuttle Landing Facility (SLF), providing an opportunity to use the same runway the Space Shuttle returned to after coming back from its space missions. 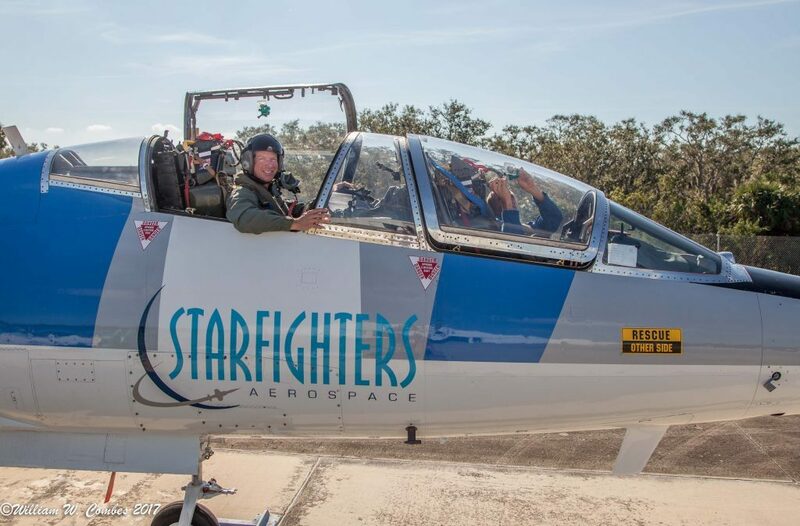 Rost completed his multi-day training program with Starfighters Aerospace, a privately-owned company that maintains a fleet of F-104 Starfighters approved for use in flight training and scientific testing. Starfighters Aerospace is authorized by the FAA to offer civilian space flight training from NASA’s Kennedy Shuttle Landing Facility. 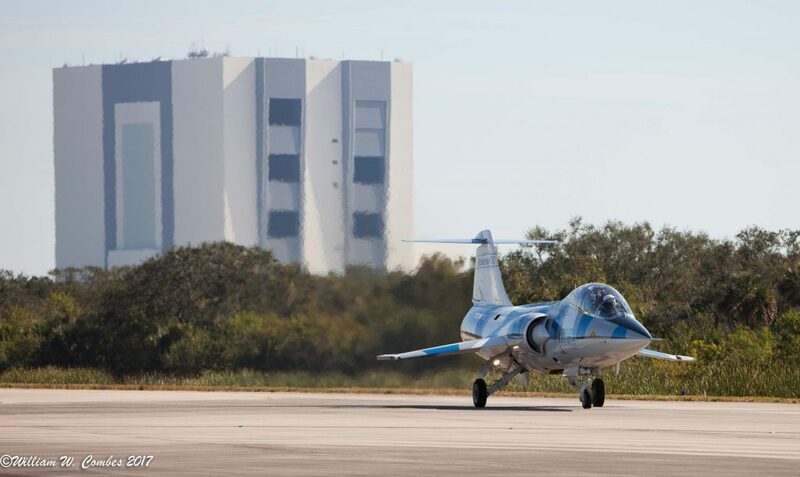 “Wow…nothing can compare to the four training flights I’ve completed thus far with Starfighters at Kennedy Space Center. As a pilot, I thought it would be impossible to top the supersonic MiG-29 flight I experienced in Russia , but being able to follow in the footsteps of the Apollo Astronauts and train in the F-104 at a NASA facility is definitely the pinnacle of my flying life…I felt like Neil Armstrong,” said Rost. The adventurer hopes to be one of the first civilians to fly to space. He has already conquered the Seven Summits, becoming the 35th American and 92nd individual in the world to climb the world’s highest mountains. John Rost preparing for the mission in the former Italian Air Force TF-104. The pilot is former Frecce Tricolori, F-104 and F-16 pilot PierCarlo Ciacchi. F-104 Flight Training follows a comprehensive syllabus for the purpose of type-specific training in the F-104 and is authorized by a Letter of Deviation Authority (LODA) issued to Starfighters by the FAA in September of 2017. The amount of time it takes to complete the training will vary by pilot, but is anticipated to range from three to ten days. Rost’s F-104 training program started with ground school and a detailed flight safety briefing, complete with ejection seat and parachute training. He then completed four of the seven training flights required to qualify for an F-104 type rating. As part of his approved training, he experienced a high-speed vertical climb designed to simulate the high sustained g-forces of a rocket launch, and a shuttle-style approach and landing over the SLF’s three-mile runway. He also performed a parabolic maneuver that produced a space-like sensation of weightlessness. 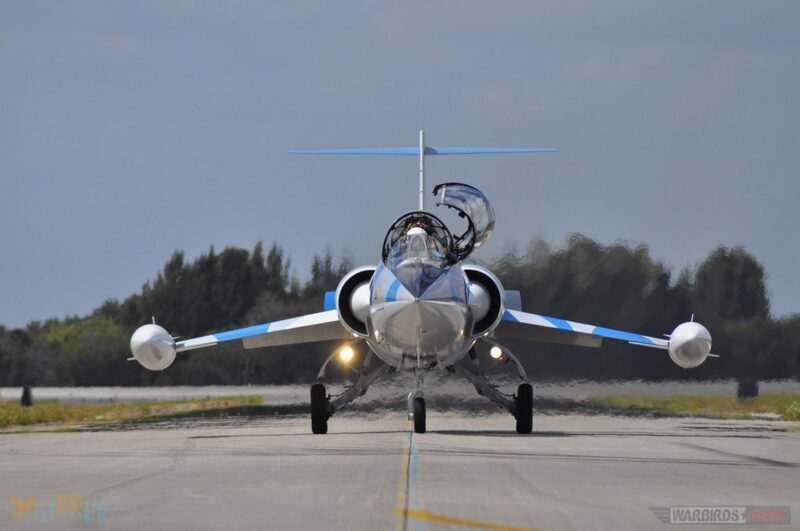 Licensed pilots interested in completing F-104 flight training can apply by contacting Fly a Starfighter at 321-282-4466 or by visiting www.flyastarfighter.com. The F-104 with its unmistakable silhouette returning from the training mission. Infinity Space is a world leading Commercial Air and Space Industries consulting, advisory and marketing firm. Based in Florida it was founded by Rebecca Zgorski, a former Washington, DC space analyst who is also one the co-creators of Embry Riddle Aeronautical University’s (“ERAU”) Commercial Space Operations Degree Program (“CSO”), the first of its kind in the world and Gregory Claxton, a 20 year commercial space veteran who previously headed two commercial space company’s business development departments. Infinity Space delivers expert work in research, education, marketing, advisory and consulting to clients around the globe in support of the Commercial Air and Space Industry. Starfighters was founded in 1995 by President and Chief Pilot Rick Svetkoff. The company operates a fleet of Lockheed F-104 Starfighters, a supersonic fighter aircraft that had a 50-year operational history with 15 countries including the U.S. and Canada. 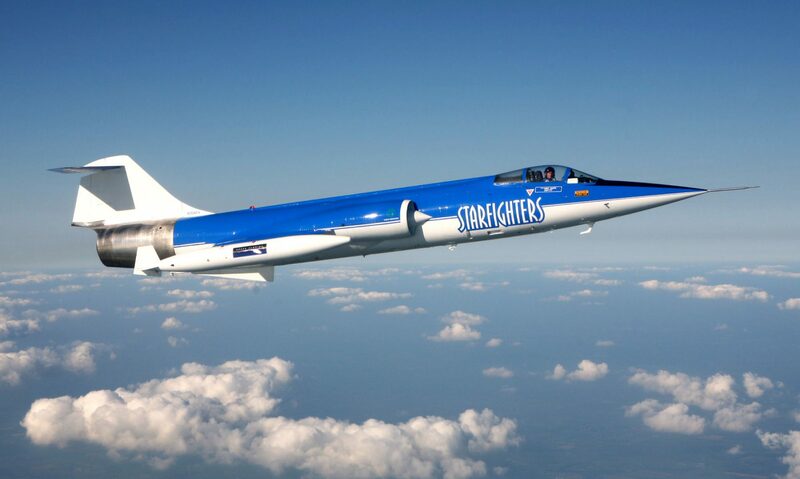 Starfighters operates the world’s only fleet of flight-ready F-104 supersonic aircraft. Based at NASA’s Kennedy Space Center and operating under authorization from the Federal Aviation Administration, these aircraft are available to government and commercial customers for a variety of missions.